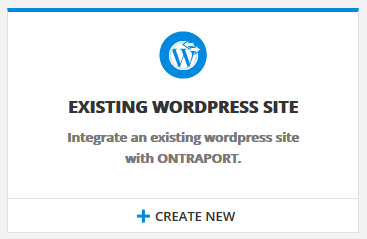 ONTRAPORT's PilotPress plugin can integrate your existing WordPress website, or you can choose to create a new membership site using a folder or subdomain on your site. Is Your Site Suitable for Integration? Cache plugins will interfere unless you list the protected pages in the exclusion list. Most cache programs include the ability to exclude pages or entire folders from the cache. An alternative to integrating your existing site is to install another instance of WordPress in either a subdomain or a folder on your existing domain. A subdomain such as "members.your-domain.com" or folder such as "www.your-domain.com/members/" works well for this. If you have any questions please contact Support. Navigate to Administration > Advanced Features > Wordpress and toggle the feature on. Enter the URL of your website in the Website URL field. Do not include a trailing slash after the domain name. 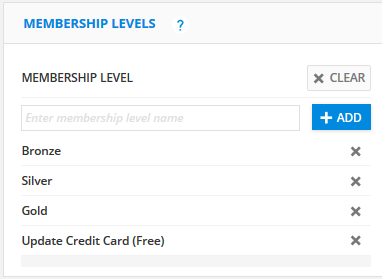 Create membership levels to your WordPress site (optional). You can return here at any time to add new membership levels. Simply type a name for the membership level and click the Add button. Click Pilot Press Download in the WordPress Plug-in/API Code section, download the PilotPress Plugin, or add it from your WordPress Administration section (search for PilotPress in your Plugins area). Copy the App ID and API Key into a text document using Notepad (PC) or Text Editor (Mac) for later use. Log into your WordPress site's Administration section. Upload the plugin if you downloaded it from ONTRAPORT or the WordPress respository by clicking Upload and choosing the file from your computer. Below is an overview video of PilotPress Settings. 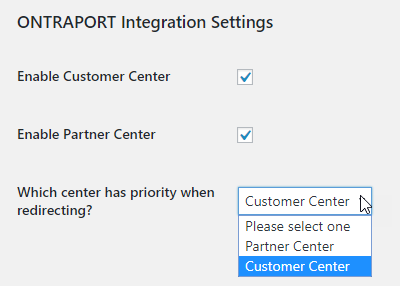 Select to enable the Customer Center and the Partner Center if desired. The Customer Center provides a place for all members to change their password, see their ONTRAPORT invoices, update their credit cards, etc. The Partner Center provides reporting and promo tools for members of any Partner Program you have set up in ONTRAPORT. If you have configured the Partner Center, any customer who is also a Partner will be directed to the Partner Center upon login. You can override this behavior by setting the Which center has priority when redirecting? drop down to the Customer Center. If enabled by selecting the Customer Center or Partner Center above, set the Post Login Redirect Settings. These settings will redirect the person to the page you specify here. The page can be the auto-generated Customer or Partner Center, or any page you have created on your WordPress site. You can also include any ONTRApage you have hosted on your WordPress site using the ONTRApages Plugin. 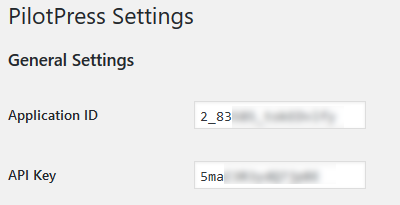 Remember to save the PilotPress changes at the bottom of Settings > PilotPress page. Is there any reason to integrate wordpress if we're not doing a membership site? There are two other features available in an integrated WordPress site in addition to the membership features, a Customer Center where contacts can see and update their contact and payment information (and see any ONTRAPORT invoices), and a Partner Center for your ONTRAPORT Partner programs (they can obtain promo tools, commission history, etc. in the Partner Center).